All of PRMan's camera modeling features are supported in RIS mode. Users can create the same glorious depth of field and bokeh effects simply, with a few camera attributes. Complete details of PRMan's Advanced Camera Modeling capabilities are discussed in the application note. Note that these apply to the standard perspective projection and are not available in the other projections. PRMan's camera can use a specified fstop, focallength, and focaldistance to create the illusion of Depth of Field for realistic cinematographic effects. These values are specified in scene units. The focal distance is the distance through the center of projection to the plane of focus. The ratio of the focal length to the fstop determines the size of the lens aperture (and therefore the amount of blur), while the relation between the focal distance and the focal length determines the depth of field. The image at right was rendered using camera settings of 1.0 for the fstop, 100 for the focaldistance, and 1.3 for the focallength. PRMan's virtual camera offers fine control over the aperture's shape and behavior. You can specify the number of sides (i.e. blades) for the shape of the aperture, rotate the angle of the aperture, make the sides of the aperture bow inwards or outwards (i.e. change the aperture's roundness), and control the aperture's density to alter the shape of the brightness. In the image at right, the aperture has 6 sides, is rotated 15 degrees, an inward bow (-0.8), and a density value of 1.0. As the image suggests, bokeh is an effect added on top of Depth of Field (i.e. 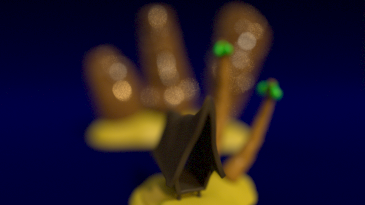 Depth of Field must be enabled). 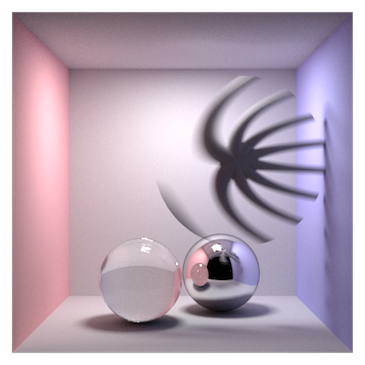 Additional technical details can be found in the Advanced Camera Modeling application note. In addition to PRMan's typical camera modeling effects, PRMan 19 added the ability to create custom RixProjection plugins. These plugins can be used to characterize camera and lens projections. The distribution includes several built-in plugins, as well. 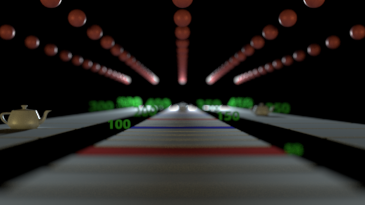 Note that whether or not the depth of field and bokeh settings apply to projection plugins depends on the individual plugin.